I will be in Natchitoches, Louisiana, April 23- 25, teaching Practical Geometry, in a full day workshop on Thursday, and 2 hr. workshops on Friday and Saturday. 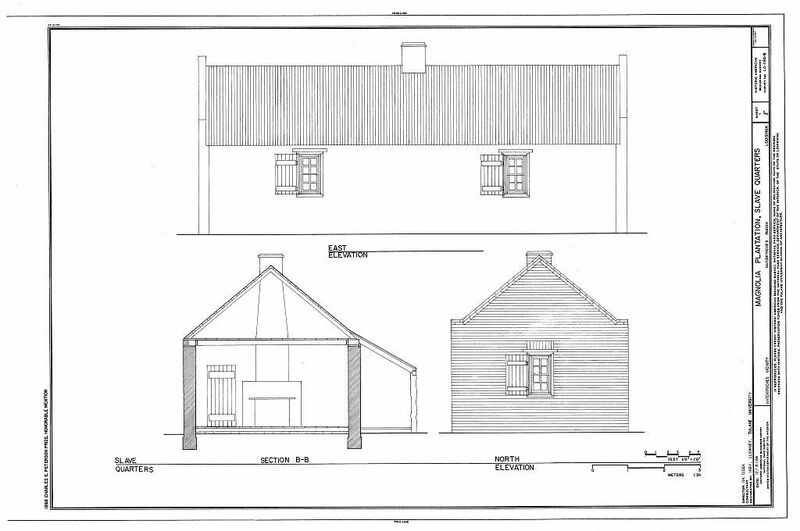 I have the HABS drawings for this cabin, but no picture, as I have not seen yet it. I hope to visit when I am at the conference. It's too easy to miss something essential when I work on the geometry of a building I have not be in and around. 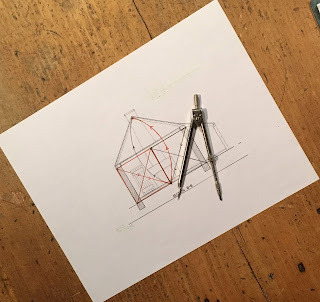 On the other hand, including local buildings in my workshops and power point talks is important, and researching their geometry will help me see them more clearly when I am there. Corn cribs and cabins were utilitarian, built using ordinary construction. 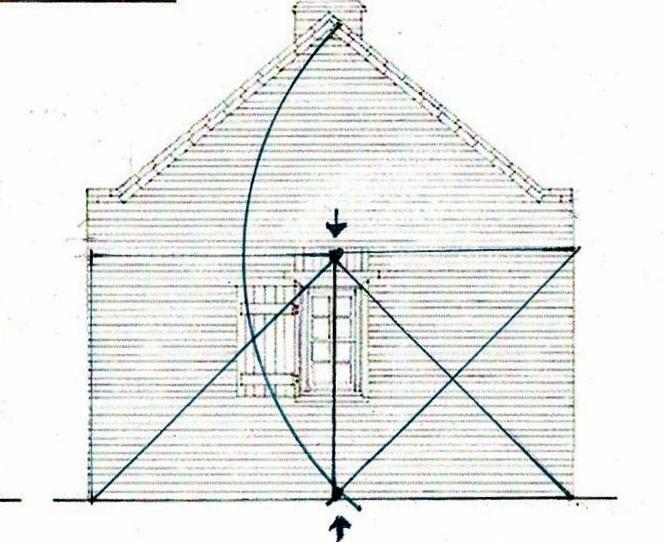 Studying these simple structures helps me understand what geometries the local carpenters used. This cabin has brick walls. It has 2 rooms with back to back fireplaces in the center. The floor plan begins with a square space and its diagonal used as a radius to draw an arc. Then another square space was added on the other side. The space created by the arc is for these fireplaces - possibly including their foundations. Follow the black line and arc with arrows and the red line and arc with arrows. The section of the cabin shows a floor set above the ground. The height of the cabin is half the width, here shown by 2 squares, beginning at grade, not at the floor. The diagonals of the squares becomes the radius for arcs; the point where they meet is the cabin's ridge. Follow the black line and arc with arrows and the red line and arc with arrows. The squares could be moved up; base on floor, top on the rafters. 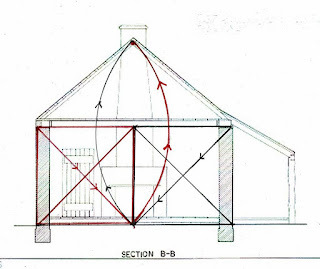 But then the arc would be above the roof line. The end elevation matches the section and locates the window - see arrows. The side elevation continues the pattern: 2 squares on either side of the center partition, the windows centered on the double square. The red square shows both the partition location, left, and the window location, right. Note that the end walls are in addition to the squares, just as the center partition is. There are 2 issues I can't resolve without more knowledge of the building and its construction. 1) The window locations on the floor plan do not match those on the end elevation. Which should I use for my analysis? Most of the brick houses I have studied use geometry to mark where an opening begins rather than a center line. Why the difference here? 2) I do not know enough about brick construction in Louisiana to make educated assumptions about framing. How do the floor and the walls join? Is there a sill? There seems to be a plate. How is the roof framed? What is the reason the end walls are higher than the sides? The site appears level in the drawing, with brick footings maybe 18" deep, slightly wider than the walls. Is that the whole foundation? Is there a foundation for the chimney? All the buildings whose geometry I've analyzed have been no farther south than Virginia. Their geometry begins with a flat base, a foundation, which can be set true and level. Where is that here? Has this to do with climate or topography? I look forward to my visit. 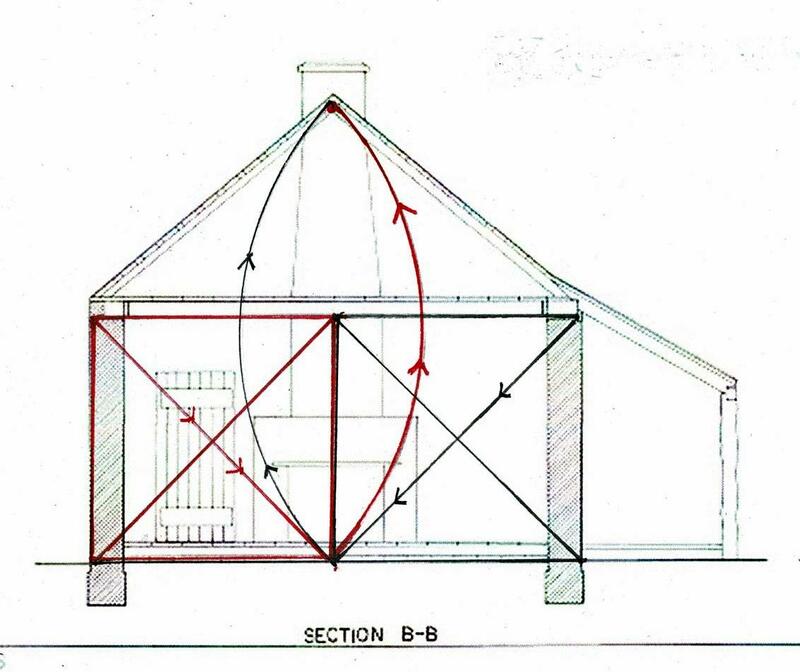 The HABS drawings call this a "slave cabin". I refer to it as a cabin. The first people who lived here probably were enslaved. They were people first, with skills and families. Maybe their names have been recorded, possibly connected to this cabin. Later free blacks and Creoles lived in these houses at the plantation. Maybe a mason or a brick maker lived here and I am studying his skill and knowledge. I have learned that on some plantations tutors and overseers who were not enslaved often had similar housing. Thanks for the note. I also hope I get to see Africa House. I have read about it, seen the HABS drawings, and attended a presentation about it. Of course I would like to study its geometry. I would indeed like to read the report. Thank you for thinking of sharing it with me.